Whenever I hear or read audiophiles discussing Odyssey products, the conversation centers on his sensational electronics- especially amplifiers. Whether it's what model, or stereo versus mono pairs, or how good is the tubed preamp it circles around electronics. 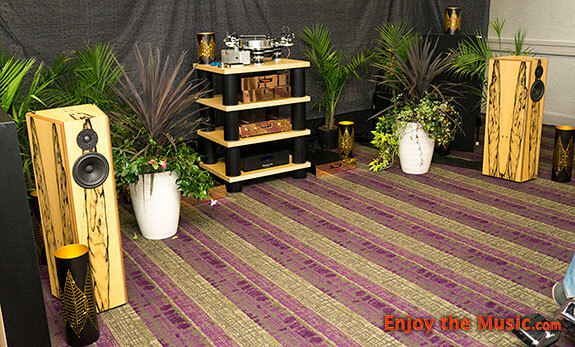 When we report on an audio show we talk about the system which includes speakers, and in the Odyssey room you listen to Odyssey speakers, mainly the Odyssey Kismet Beryllium Reference loudspeakers ($4,200/pr) featuring the best drivers ScanSpeak produces, the Beryllium tweeter and Revelator woofer. I'm telling you Klaus gets everything out of those two drivers you need to feel emotionally seduced by music. The Kismets play loud without strain or glare, go deep with authority giving your chest impact and pressurize a room, accurate tight bass, with tons of information especially in the upper octaves courtesy of the seriously expensive tweeter. 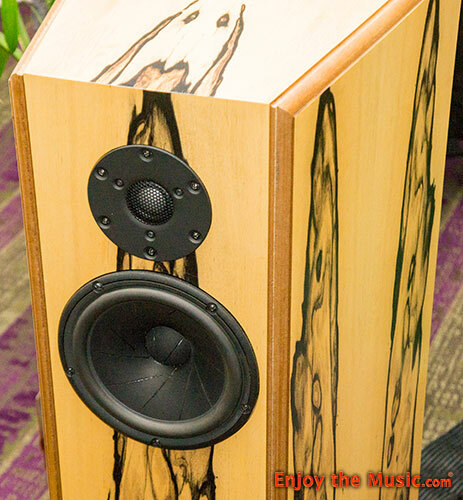 Crossovers are the secret sauce in loudspeaker design, and Klaus has fine-tuned the Kismet's over the years to a stunning result. The usual suspects were in the Odyssey rack to make the system come alive. 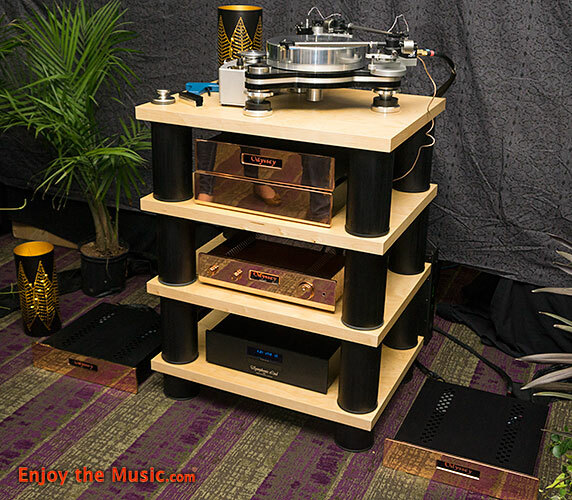 A pair of Khartago Mono amplifiers ($1,995) and Candela Tube preamp ($1,600) drove the Kismets. The entire Odyssey package goes for only $7,800, but for the show he offers the whole shebang for $6,900 including cabling, a stunning value. 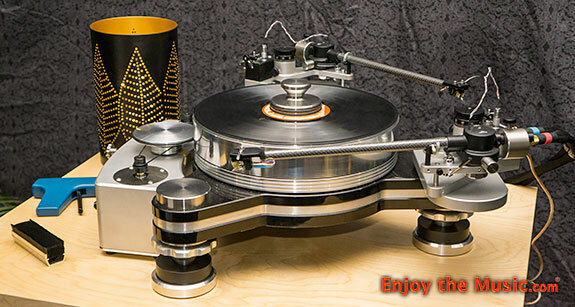 Klaus uses his own, not borrowed VPI turntable, and spins records most of the time. He also knows how to set the tone of the room, with carefully placed nightlights turned on, he will turn off the room lights to let you focus on the music. Klaus played a personal favorite right off the bat, the Mobile Fidelity One Step version of Santana's Arbraxas, and wow it was sensational. The soundstage spread wider and deeper than the already big room, great instrumental colors with lots of air and space, big dynamics, great bass extension while being tight and quick (bongos were especially real sounding), and those glass chimes sounded like the wind was blowing them right in the room. The Door's "Riders on the Storm" followed, and the illusion of waves crashing on the shore made you check to see if your shoes got wet, very involving emotionally, and romantic as well because a couple started slow dancing and making out during the song. A different couple started to leave the room and I mentioned to them what a great value the Odyssey system was, they agreed and Klaus used his magnetism to coax them back in and asked the wife what song she wanted to hear, "Stairway to Heaven" came back in seconds, so Klaus dug out Led Zeppelin IV, put her in the magic seat, turned off the lights and lowered the stylus. Eight minutes later she announced she didn't know it could sound that magnificent and live like a concert, they both loved it as did I, congratulations Klaus on getting another couple interested in the fidelity of music listening.